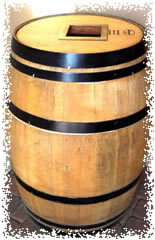 IF you have an idea or if you need a special barrel, please let us know! NOTE: Oak will shrink if not kept moistened. To avoid ring slippage, please reinforce ring/hoop with self tapping screws. UWB is not responsible for breakage if product is altered by purchaser. No Returns on Custom Made Orders! CAUTION: There may be sharp edges. Use caution when handling or moving product. Handle with care and at your own risk. Nestled deep in the heart of the Historical Napa Valley Vineyards of American Oak Used Wine Barrels are stacked silently and carefully until the right time... the right time to spill forth the "fruit of the vine". Carefully crafted and built to exact dimensions, these RARE nostalgic masterpieces, some still stained from their former burgundy companion, are being retired to the public. Just one look at these spectacular works of art makes your heart leap and the lump in your throat explodes with, "I'VE ALWAYS WANTED ONE OF THOSE"! 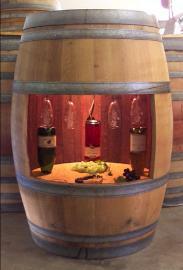 Wine barrels range in price from $450 on up to $700 generally. 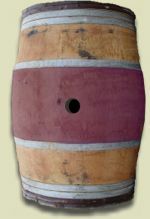 Filled with wine, the barrels are valued at approximately $2500, or $42 a gallon, depending on the style of wine as well as the vintage (year harvested). While our supplies last, we will ship you these tremendous works of art to your door. 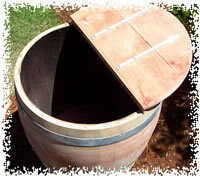 We offer EMPTY USED Full Size or Half-cut Size Planter Barrels at a fantastic price. 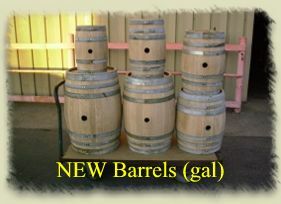 You may choose to use these barrels as an wine barrel planter, an old trash barrel or a rain catcher. Own a piece of history. Order 1 or 100 at a time, we will fill your order. 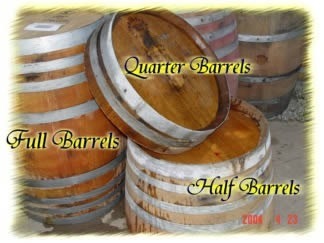 NOW we have BARREL HEADS and Quarter Barrels! 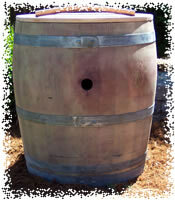 Did you see our Composter, Garbage Cans & Rainbarrels yet? Half barrels, cut longways with an open front. This is a great way to display a statue, fountain or potted plant. 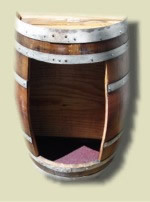 Half barrels, cut longways with an open front and Shelf. 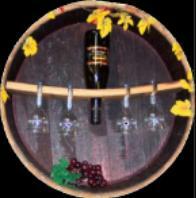 Display wine bottles, glasses, or collectables. 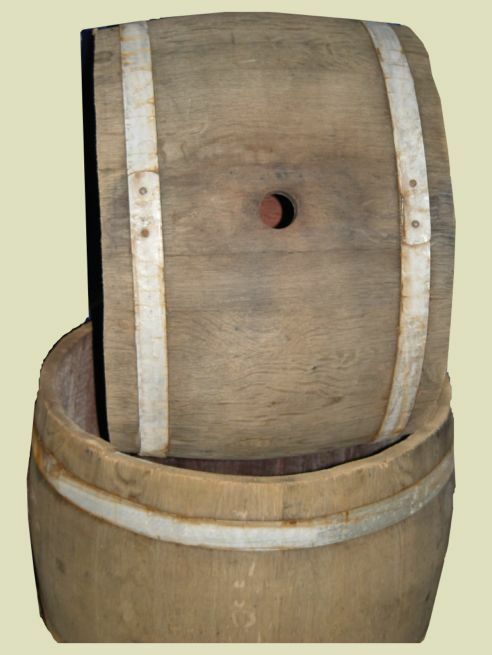 This Barrel is approximately 38 inches tall. A Full barrel with Special Chestnut bandings. 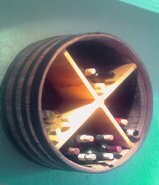 Two Chestnut bands on each end adds a certain prestige and elegance to this wine barrel or choose traditional metal bands. Call to Check Inventory !!. 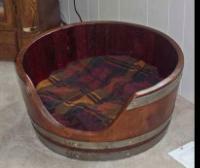 Add a BURGUNDY STAIN to the middle girth of this Wine Barrel for that rich style decor. 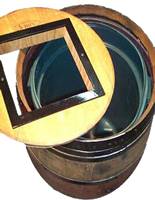 Half barrels, cut longways with a closed front and closed back. This leans against the wall and gives the illusion that a barrel is built into the wall. Great for holding a plant or collectable. 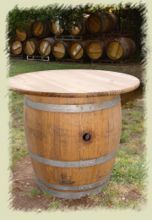 Half oak wine barrel, cut longways without the back, it becomes a long oak barrel planter. 3/4 barrels have so many applications available. 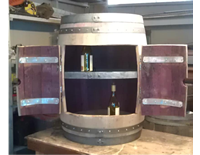 Recyle your cans or decorate your landscape or kitchen with this very attractive used wine barrel trash bin. Available in 2 top sizes. 8 inch or 11 inch opening. Great for inside or out, our storage container has plenty of storage room. Store all your blankets, winter stuff, cloths, dog food, yard waste, yard tools, the ideas are endless. A barrel stave handle mounted on the hinged cedar top is not only attractive but very functional. Natural or Oiled for outside use. FOR MORE PRODUCTS.. CLICK HERE! No order too small nor too large! Sponsor Site of the Month!